Chinese automotive conglomerate SAIC Motor Corp Ltd and local commercial vehicle distributor Weststar Maxus Sdn Bhd have signed an assembly and distribution deal worth up to RM1 billion in a move that could see the return of the MG brand in Malaysia, according to The Star. The report from the English language daily, citing sources close to the deal, states that SAIC is looking to take up a 49% stake in Weststar Maxus and will provide the distribution rights for its wide range of vehicles, including cars from the MG brand, passenger vans and pick-up trucks. These will add to SAIC’s Maxus brand of commercial vehicles that Weststar already sells. In addition, SAIC will also join forces with Weststar Maxus to set up an assembly plant here – Weststar currently builds Maxus vehicles at its facility in Port Klang, so this plant could be used for MG’s CKD operations. South East Asia has been SAIC’s target for expansion for quite some time now – it has been assembling MGs in Thailand since last year with the MG6 (the MG3 hatch was added earlier this year), and has recently signed a joint venture to set up a plant in Indonesia. Weststar is currently wholly-owned by “AP King” Tan Sri Syed Azman Syed Ibrahim, who previously held the franchise approved permits (AP) for Honda and Chevrolet. Back in April 2013, Volvo dealer Federal Auto and SAIC entered into a memorandum of understanding (MoU) as a first step towards reviving the MG brand in Malaysia, with a view of CKD local assembly. The recent deal with Weststar indicates that this agreement has since fallen through. okay good. now get the eev incentive and sell us the car very cheap. Naaaahhhhh..better get the facts right.While the MG brand ownership is in the hands of the Chinese (and the majority of the production in China as well), the Design & Engineering works are still being done at Longbridge in the UK by the same British team. That’s why the latest MG cars could easily be marketed in the UK, and the marque itself is currently among the front runners in the British Touring Car Championship (BTCC)..
MG is an iconic British name. Transfeering that name to a china (still very much associated with ciplak, low cost, low quality) will only diminish its brand’s appeal. Before it fold, MG is not selling because of quality problem. Now the public are being offered something similar, except that it doesn’t look British at all, just a cheap looking tin box. You’re definitely better off with the Koren brands. Success in BTCC has very little origin in the commercially available cars. If you care to put enough money, you can turn any Perodua model into a BTCC winner, including the Rusa. Too many brands already in malaysia and not many give consumers better offering! The MG3 & MG6 are good alternatives in the burgeoning local small & medium segment cars.The cars are still British engineered. I’m for any foreign investment to Malaysia, and that new job opportunities. As you know our consumer here are very knowledgeable of cars, and they know what best features and functions for cars. I read UK car review of MG model, it gave a pretty good review in car design but engine lack of punch. I hope SAIC produce cars affordable to Malaysian market that gives more options for our consumers. And SAIC is number 2 auto company from China investment to Malaysia not too crowded I think. It does give Japanese and Korean some jitter the fact China present may erode their market share. I don’t think the success rate is going to be high in this market. Welcome, welcome ! Thank you SAIC-MG for investing in our Malaysian automotive industry and helping create more jobs for our future generations. I did not see this coming at all, I thought when SAIC-MG set up base in Thailand, they intended to make Thailand their ASEAN hub (as most major foreign companies have). I thought it was just Great Wall and Chery that selected Malaysia as their ASEAN hub, but SAIC-MG intends to have more than one ASEAN hub it seems. I must say that these big Chinese car conglomerates have A LOT of money… else they wouldn’t be able to splurge on costly CKD plants in each and every potential market, in each and every corner of the globe. As for SAIC-MG’s performance in Thailand; unfortunately, it has been quite poor, worse even than Proton Thailand (which suffered a large sales drop in 2014 and still is today). For the most part, SAIC-MG only had only one model in Thailand, the MG6, it’s very similar to our Proton Prevé. However, it’s not as good a car, but it has a nicer interior and is better equipped. The Prevé is still far safer and handles admirably. Despite the reputable MG badge, the MG6 has not sold well in Thailand so far. 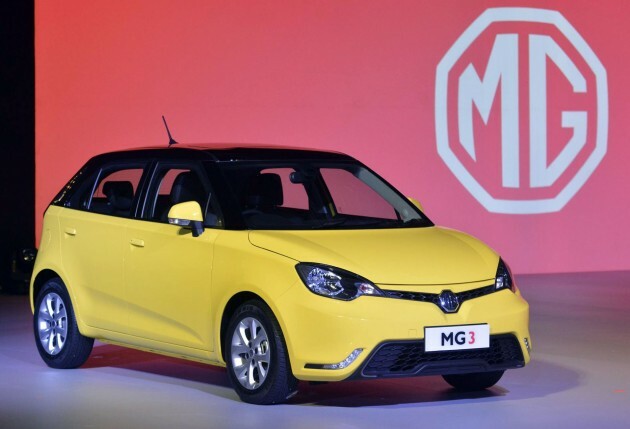 However, now it seems that the MG3 has started assembly in Thailand and is being sold at competitive prices, so maybe things will improve soon for MG Thailand. My predictions for SAIC-MG in Malaysia; it’s most likely that they will bring in the MG6 only, for domestic consumption, since they’ve already made mention that the Thai-assembled MG3 will be exported to ASEAN countries and Malaysia will get it next year. Since Malaysia is a sedan-dominant market, the MG6 has a small advantage already. Should Weststar price the MG6 in the affordable RM70k to 90k range (Vios, City price range), they may sell a modest number of units. If it’s more than RM100k, then it’ll never sell regardless of how good it is (it isn’t anyway). However, even if it’s priced well, there may be a chance that SAIC-MG may not do well here, as Great Wall’s M4 SUV did not take off as many Malaysians expected (myself included), and posed no threat to Perodua or Proton. The M4 itself is honestly a good buy, even the reviews were quite kind, yet Malaysians were apparently not ready to trust Chinese brands again ever since Oriental Holdings brought in the Chery Eastar MPV which rose and fell overnight due to poor reliability and build quality (worse than the worst Protons). The new Chery Maxime has not sold well either, not as well as the original Chery Eastar did in the late 2000s at least. Anyway, for now, I’m happy to hear this promising news and I wish SAIC-MG and Weststar all the best, and as always, my dua tangan thumbs up to you guys. Errr… thank you for sharing ? Just to be fair to both sides, the Prevé has been in Thailand since late 2012, their 2013 sales (248 units) is more than MG6’s 2014 sales. Ever since the Suprima S was launched in Thailand, the Prevé couldn’t sell, at least until Proton Thailand launched the Prevé LPG, which sold a few more units. Now in 2015, Proton’s sales are extremely poor compared to the previous years. SAIC-MG’s sales should pick up with the MG3, but if it’s not LPG, then it’ll never truly take off. If Proton wants to sell the Iriz in Thailand, they better make a LPG model too. The reason MG6 never sold well in Thailand is because it is priced really high. Almost at the level of Camry and Accord and who would invest that much money in a newly introduced brand? I feel like the MG6 was just a product to introduce the brand to the market, not intended as a big seller in first place. However, MG3 is priced quite cheaper than Japanese brands and the feedback from the public seems promising. Later this year, They plan to introduce MG 5GT and MG GS SUV in the Thai market. Pretty aggressive for a new brand.